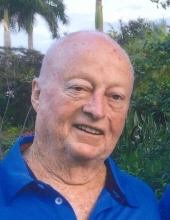 Joseph A. Kniery, 77, of Normal, died peacefully at home surrounded by his family on Sunday, April 7, 2019. He was born September 11, 1941 in Bloomington, the eighth child of Simon Joseph and Anna Veronica (Jordan) Kniery. Joe was in the Air Force from 1960-64, stationed in Omaha, Nebraska at Offutt Air Force Base. He worked at GTE as a Computer Analyst for over 30 years. Joe retired at the age of 52 and enjoyed spending time with his wife Loralea, family, and friends, watching the St. Louis Cardinals, and following the stock market. He is survived by his wife of 30 years, Loralea Kniery; his former wife, Patricia Thompson; children, Joseph (Anita) Kniery, Colleen (Jack) Spaniol, Debbie (Jane, friend) Kniery and Thomas (Chuck) Kniery; six grandchildren, Alicia Kniery (Nick), Alexis (Ben) Freed, Zack (Rebecca) Spaniol, Nick (Brooke) Spaniol, Jacqueline Spaniol and Kailee Spaniol; a great-grandson, Jaxson Spaniol; and a sister, Sister Clarice Kniery, O.P. (Rita Rose). He was preceded in death by his parents and six siblings, Ed, Jerry, Mike, Jim, Ann, and Marge. His funeral will be at 11 a.m. Thursday, April 11, 2019 at St. Patrick Church of Merna, Bloomington, with Rev. Dustin Schultz officiating. Burial will be in Holy Cross Cemetery, Normal. Visitation will be from 9:30 a.m. to 11 a.m. Thursday, April 11, 2019 at the church. Memorials may be made to OSF Home Care Services. Carmody-Flynn Funeral Home, Bloomington, is in charge of arrangements. "Email Address" would like to share the life celebration of Joseph A. Kniery. Click on the "link" to go to share a favorite memory or leave a condolence message for the family.